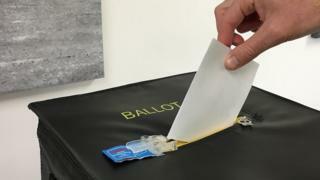 Guernsey voters are set to elect politicians from an entire island constituency, rather than by the current district system. More than half of voters backed the change in the island's first ever referendum, which saw a 45% turnout. Option A - one island-wide district - won with 6,017 votes, representing 52% of the final count. It means all 38 Guernsey deputies will be elected in a single vote on the same day, every four years, from June 2020. More stories from Guernsey and the referendum latest. Option A campaigner Deputy Carl Meerveld said he was "ecstatic and relieved." "I think it changes everything," he said. "It'll change the nature of the debate. It'll change the characteristics of the people who stand and who are successful. "Instead of having a popularity contest at a parish or district level we'll end up with a policy debate at an island level." Deputy Meerveld added he hoped the move would encourage party politics. Five options ranged from the current district-based system to the formation of a single Guernsey-wide constituency. Politicians backed the referendum in 2016, a move which required the creation of a referendum law. Voters went to the polls on Wednesday 10 October, with the result announced about 18 hours after voting ended. The alternative voting system meant least favoured options were knocked out, before two remained. In the final count Option A beat Option C, a combination of district and island-wide voting. The island's parliament had agreed to adopt the outcome of the referendum if 40% of people on the electoral roll cast their ballot, a threshold confirmed earlier today. Chief counting officer Jurat David Robilliard said 14,370 votes had been cast, meaning a turnout of 45.1%. Guernsey voting referendum: What are the options? EU referendum: What do the Channel Islands think?